If you ever wondered why they named these 'Violet-green' these photos will demonstrate that those these birds are violet, blue and green colored. 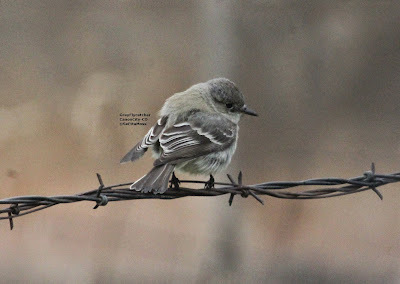 When I checked this morning after my class I found 12 Gray Flycatchers in the same locations I checked yesterday. They were all actively foraging but not with much apparent success--it was still pretty chilly so not much insect activity. So I went to the one local pet store in my town for mealworms. They were out of mealworms but I saw they had crickets, which sounded like a better choice for this type of bird. So I bought their last 40 or so 'small' (pretty tiny) crickets. Then came the task of figuring out how to get them to the birds which do not allow close approach. 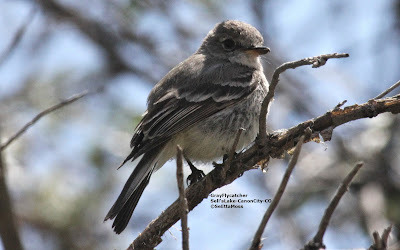 I tried throwing some up in the air near two flycatchers in hopes they would see them wiggle on the way down--didn't look like that worked so I just threw a handfull next to locations I had seen the birds foraging. I think I saw a robin pick up and eat one of the crickets but I needed to drive to the other locations so couldn't just watch. The late season rain and snowstorm that dropped almost an inch of rain and maybe an inch of snow at my house created 'fall-out' conditions that brought amazing numbers of empidonax flycatchers down in Canon City along with lesser numbers of other neotropical migrants. 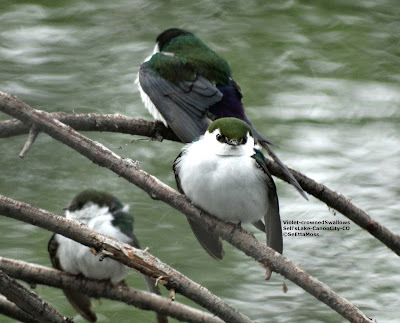 I birded from the far west end of Riverside Ave including along that road, little Veteran's Park and the Sell's Lake and nearby parking area of the Canon City Riverwalk starting at 9:30 am. 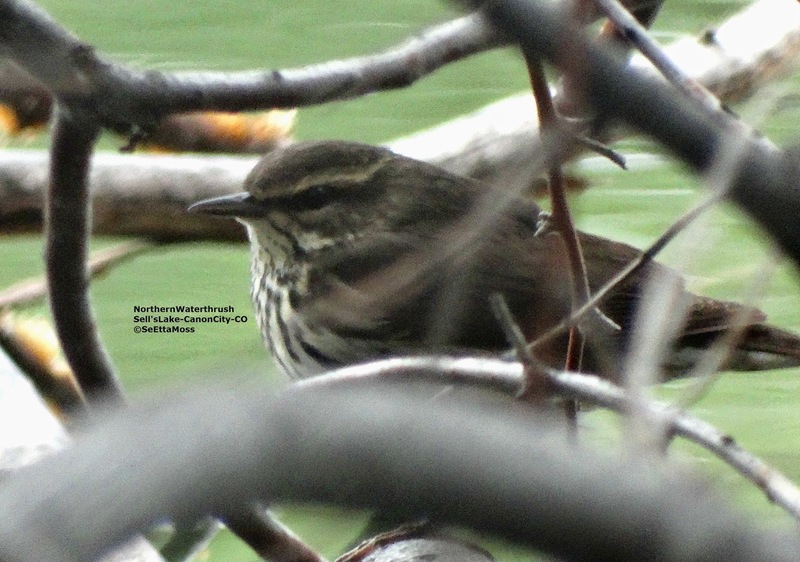 All but about a half hour was car birding (as I am trying to recover from a bout of bronchitis and the cold, snowy weather was not conducive to that). The real action with all the empids didn't start until close to noon and went on to late afternoon. Both a male and female Rose-breasted Grosbeak, first of the year birds, flew between my yard and my next door neighbor's yard. 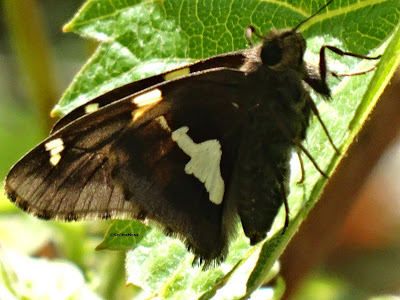 Here is the male eating at one of my neighbor's feeders. 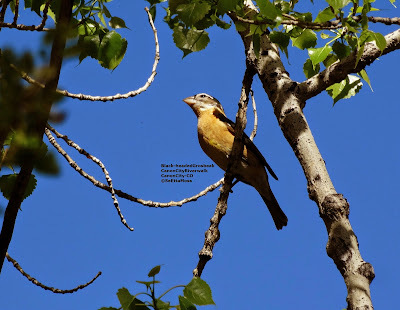 I didn't photos of them but my neighbor and I both had Black-headed and Evening Grosbeaks in our trees also--three grosbeak species not just in one day but all three were present between 6 and 7:30 pm when a rush of birds came through. Last year we had a pair of Rose-breasted Grosbeak that spent the summer so I am hoping this pair chooses to stay with us this year too. 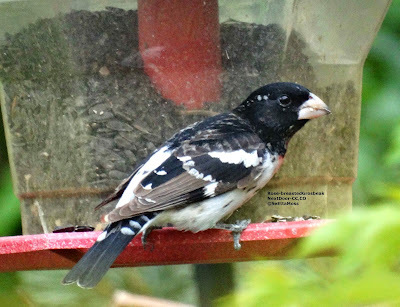 These Rose-breasted Grosbeaks really like chokecherry trees, a wonderful native species, in my neighbors' yards and that is what it is perched in. 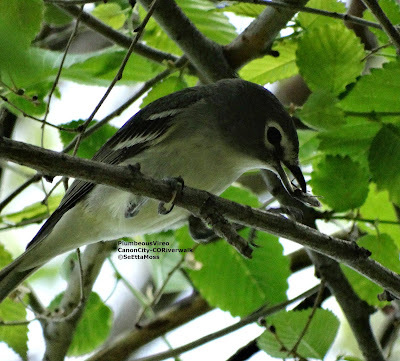 A number of warbler species worked their way through my trees including several Yellow as well about 30 Yellow-rumped, and 3 Orange-crowned Warblers. And all of these warblers came through my yard and my neighbor's yard between 6 and 7:30 pm yesterday.